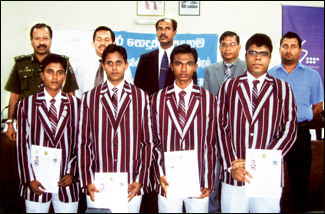 Nalandians Lahiru Iroshan Ramanayake, Tharindu Wickramasinghe, Gihan Kalana Bandara and Gayan Samarakoon were honoured at the Second National Students Bravery Awards 2010 held at the Ministry of Education Auditorium recently. (Back Row) - DIG Ashoka Wijethilake Esqr. Additional Sec Ministry of Education H. U. Premathilake, MIC Life Saving Nalanda College Manoj Ranawakarachchi, Founder President Civilian Bravery Kasun Chandrarathne, Head Coach Nalanda College Aquatic Sports and Life Saving Roshan Wijesinghe. Nalanda College Life Saving Club has a proud history of 30 years of conducting voluntary duties at Mt. Lavinia Beach on every Sunday and hold responsibility for saving nearly 600 lives. (recorded rescues). Nalanda College is the first school to join with the life saving services in Sri Lanka. Foundation of Civilian Bravery has been organizing the National Bravery award ceremony for the Last 16 years and Student awards were presented at the National event for 14 years before it became a separate event for the last two years. The Awards were presented for helping another to save lives in peril which we believe it contributes the four student life Savers from Nalanda College has saved more than 25 lives during the last year while performing voluntary duties at Mt. Lavinia Beach.